We present our esteemed customers with a wide range of Sauna Bath Wooden Customized Room Splecial Wood in Hemlock/Cedar, which are available in different variations. 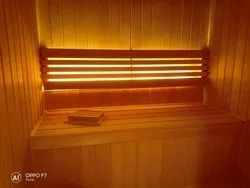 All our Sauna Room are designed with precision Tongue Groove panels and with all other necessaries that makes them special from others. Heater Fence 2"x 2" &1" x 2"
Walls and Ceiling shall be 1/2"x 4" select, certified, kiln-dried (moisture content not exceeding 11%To 15) T&G, v joint, clear, 1/2"x 4" vertical grain Douglas Fir, clear 1/2"x 4" Western Red Cedar, or clear 1/2"x 4" V.G. Western Hemlock. All boards shall be blind nailed with 5p galvanized, hot dipped nails. Packaging Details: Maintenance Steamers India Sauna heaters and rooms require minimum care and maintenance. Basic household methods, including cleaning of Sauna room floor with a product such as Pine Sol, and occasional scrubbing of benches with a mild soap, is necessary for sanitary and odor-free atmosphere. When wood becomes dark or stained from perspiration, a light sanding will help to restore its beautiful appearance. Do not use sealers, paint or varnish on interior wood, as toxic vapors could be dangerous in the high temperatures of a Sauna. 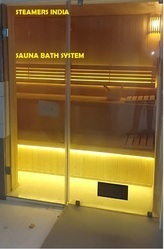 Steamers India is one of the leading manufacturer in sauna room with 15 years experience.Our products have been Used to over 200 clubs, Hotels, Resorts, Hospitals, ITI, Govemerment Organistaion, Military Organisation & Residentials and regions due to competitive price and high quality. Our company implements a strict quality control system and has obtained many quality Experience and so on, therefore our company enjoy a great reputation in India & overseas market. We have enough strength and confidence to provide high quality products and the most competitive price in the global area to our customers. OEM is alailable and acceptable. We are your reliable business parnter and supply you with high quality product and servie. Our Sauna can be customized to suit your space, budget and taste requirements. The outstanding construction surpasses your expectations every time you unwind in your Sauna and ensures an ideal and safe environment. Fine craftsmanship and superior material used produce Saunas that are cool to touch, resistant to distortion, shrinking, discoloration and corrosion. ●Before taking a sauna, remove all clothing and jewelry (jewelry may become very hot at sauna temperatures). Shower with soap before use, and wear a towel loosely, where required orappropriate. Drink plenty of water before and after the sauna bath. ●Shower with cool water after every 5 to 15 minutes in the sauna. This allows the body to cool, the pores to close, and the body to be refreshed. Do not remain in the sauna beyondyour individual capacity, which may vary from time to time. Allow enough time to relaxcompletely and rest between cycles. Never remain in a sauna longer than it is comfortable. ●After the sauna, rinse with cool water to close the pores of the skin. Do not dress until your body has properly cooled. If you dress too soon after the sauna, you will begin to perspirein your clothes. ●Keep all plastic, metal, and glass objects out of the sauna, as they can become too hot to touch. If you do intend to drink water while using the sauna, keep the water container onthe lower level. ●Do not use the sauna immediately after a full meal or rigorous exercise, as your body’s blood flow is adjusted by these activities. Give your body a few minutes to adjust to a normal statebefore entering the sauna because the sauna will increase your body’s circulation. ●Do not smoke, exercise, or drink alcohol in the sauna room. Do not use the sauna while under the influence of drugs or alcohol. ●Pregnant women and people with heart disease, diabetes, or either high or low blood pressure are advised to consult a physician before entering a sauna. ●Unsupervised use by children or people requiring assistance may be hazardous. Packaging Details: Standard Saunas Room (SSR) are installed into rooms that are already framed, insulated, wired and sheet rocked. They are offered in various sizes as per your requirement, commonly custom built to fit your exact room using our free CAD design services. We work with you and/or your contractor to make sure your room is designed and installed just the way you want it. The SSR package includes 1/2" thick Canadian Hemlock for the walls and ceiling, 20" wide benches, door, sauna heater, and "DuraGrid" tiles in the walking area. Our standard accessory package includes a pine bucket, pine dipper, thermometer, wall light and head/back rests. These packages are suitable for either residential or commercial applications. The standard SSR sauna is a great way to bring the benefits of sauna into your home, hotel or club at a very affordable price. 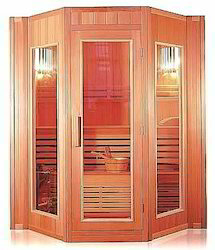 Steamers India sauna panels are available in four different designs, all made of grade A wood. The panels make a perfect match for Sauna 2 layers solid benches. 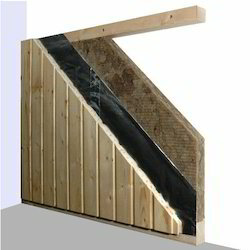 The spruce panel has an STS profile of 12 x 95 mm. Dimension: 85 mm. Our company is highly esteemed in providing Sauna Bath Model SI500N to the clients. This product is used to experience dry or wet heat sessions.